From supporting the organization of the event both programmatically and financially, to organizing various parallel and side sessions and taking part in an exhibition together with other CGIAR centers, IITA was very active and visible at the recently concluded Africa Agriculture Science Week (AASW). 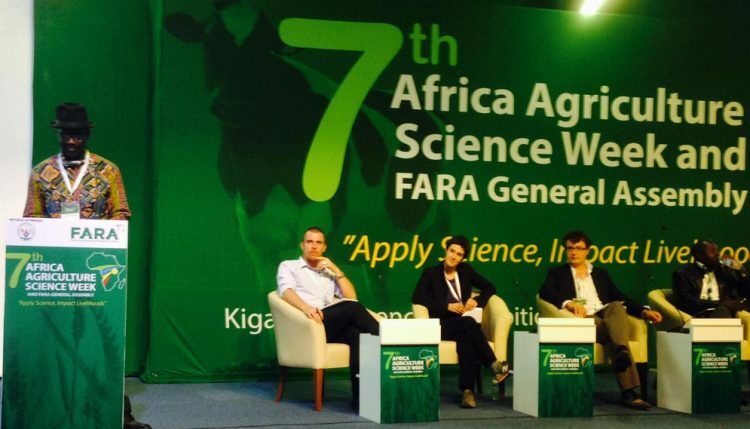 The event was organized by the Forum for Agricultural Research in Africa (FARA) in Kigali, Rwanda, 13–16 June, alongside its General Assembly. The IITA delegation at AASW was led by DG Nteranya Sanginga (left) and DDG Kenton Dashiell (right). IITA also had a large delegation present at the event led by Director General Nteranya Sanginga, Deputy Director General for Partnership for Delivery, Kenton Dashiell, and Director for Humidtropics Kwesi Attah-Krah. Also present were staff from its hubs in Central, Eastern, and West Africa as well as representatives from the IITA Youth Agripreneurs. The AASW brings together all key stakeholders in African Agriculture Science, Technology and Innovation (STI) to exchange ideas on latest developments and trends as well as strategize on ways to push for more investment in African agriculture as a key driver for economic development. The theme of this year’s event was ‘Apply Science, Impact Livelihoods’ and discussions focused around the following subthemes: Institutional systems and policies for making science work for African agriculture; Sustainable productivity growth, value chains, and profitable agribusinesses; Human capital development and the youth; Sustainable financing of science, technology, and innovation for African agriculture; and Megatrends in African agriculture. The event brought together over 1500 key stakeholders in the agriculture sector in Africa and beyond. by IITA, Bioversity International, and FARA discussed how to support agricultural intensification in Africa for food and nutrition security and poverty alleviation. “Integrated systems research involves taking a holistic approach to enhancing agriculture and the livelihoods of smallholder farmers. It involves looking at the farm as a system to identify the interactions, trade-offs, and synergies between the various components and not neglecting such aspects as nutrition and gender. During this session various presenters of the Humidtropics program shared their experiences of working in an integrated manner through multi-stakeholder platforms that were vehicles for facilitating collective action to address agricultural challenges. Experiences were shared from Burundi, Cameroon, DR Congo, and Rwanda. Piet van Asten, IITA Systems Agronomist based in Uganda, was a keynote speaker during the parallel session on “Achieving sustainable productivity growth” on the second day, where he also continued to build a case for a systems approach. Van Asten said a systems approach looked at increasing productivity from four dimensions: increasing productivity at the farm level through improving the overall efficiency of the production system, ensuring household members invest and benefit in an equitable manner through addressing gender issues, having in place enabling factors required at the community level, and creating a favorable institutional and policy environment. He gave examples from ongoing IITA research in Uganda that was addressing these dimensions to achieve a sustainable increase in the production of important staple crops such as coffee, banana, and potato. Paul Dontsop, an IITA Impact Economist based in DR Congo, further shared some of the successes of the Consortium for Improving Agricultural Livelihoods in Central Africa (CIALCA) project through its systems approach, which had lifted over half a million people out of poverty. CIALCA is led by IITA and Bioversity and brought on board a wide range of partners in the three project countries: Burundi, DR Congo, and Rwanda. Dontsop said that success factors included local adaption of technologies, and flexible and long-term funding that also invested in partnership building. This supports the case for sustained long-term funding of research. At the end of these sessions it was concluded that sustainable productivity growth has biophysical technological, sociocultural, economic, institutional, and political dimensions that are interrelated, thus the need for systems thinking in agriculture research and development. Kwesi Atta-Krah (left) leads panel discussion on sustainable productivity growth. “Sustainable productivity growth calls for coherent action across farm, community, regional, national, and international levels and for collective action from all stakeholders―farmers, research, markets, policymakers, private sector,” said Marc Schut, IITA Social Scientist based in Burundi, while summarizing the conclusions from these sessions on the last day of the event at the FARA General Assembly. “Both technological and institutional innovations are required for sustainable agricultural growth. New technologies such as new varieties are important but they will not have impact if they are not accompanied by appropriate institutional arrangements such as having functioning seed and extensions systems,” he said. Another subtheme in which IITA was active was on how to develop agricultural value chains and involve youth in agriculture. IITA co-organized a parallel session on this on the second day together with the International Center for Tropical Agriculture (CIAT) and the African Agribusiness Incubation Network (AAIN). The session noted that for agriculture to develop, strategies to move smallholder farmers out of subsistence into commercial farming were key. Mentoring youth in agriculture was considered very important as well as the need for continuous innovations. The session also applauded the IITA Youth Agripreneurs initiative, which is now operational in six African countries: DR Congo, Kenya, Nigeria, Tanzania, Uganda, and Zambia. It was noted that the model had very good potential for scaling up to many more countries. IITA DG Nteranya Sanginga was a panelist on a parallel session on Sustainable financing of STI for African agriculture organized by the Africa Development Bank (AfDB) and the Alliance for a Green Revolution in Africa (AGRA). There it was concluded that African countries cannot continue business as usual and that there needs to be a mindset change by African governments to prioritize agriculture. The group also praised the funding plan of the AfDB on agriculture which they said would go a long way to give the sector the much needed push. CIALCA also used the opportunity to mark its 10th year anniversary. The project organized a side event that was graced by the IITA DDG for Partnership for Delivery, the Director General of Agriculture Development at the Agriculture Ministry, and Ambassador of the Belgium Embassy in Rwanda, among others, and attended by partners and friends of CIALCA from Burundi, DR Congo, and Rwanda. 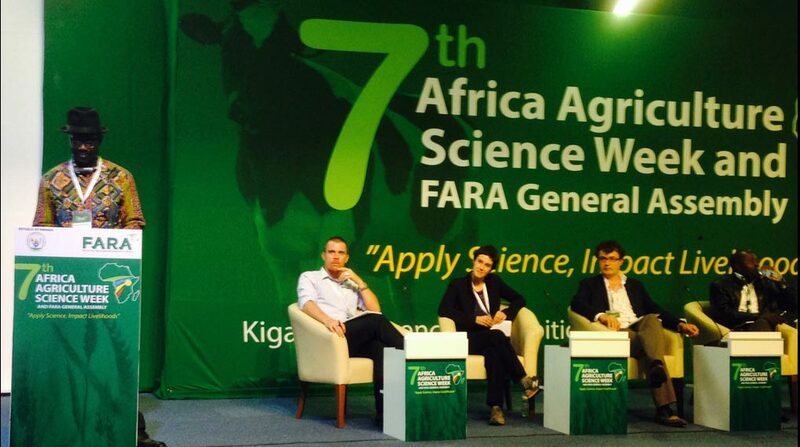 The Africa Science Week and FARA General Assembly are organized every three years. The previous AASW and FARA general assembly were held in Accra, Ghana, in July 2013.